The iMac (24-inch, 2.8GHz Intel Core 2 Extreme, Mid 2007 AI) was at the time of introduction the top Intel Mac iteration. This is the all-in-one desktop computer in a glass and aluminum one-piece casing behind the 24” screen, mounted on an aluminum stand with an adjusting hinge. The RAM and hard drive capacity had been significantly increased and the desktop had got the fastest Intel processor of the time and the fastest motherboard platform – Centrino Santa Rosa. The iMac (24-inch, 2.8GHz Intel Core 2 Extreme, Mid 2007 AI) features a 2.8 GHz Intel “Core 2 Duo Extreme” processor (X7900), with two independent processor “cores” on a single silicon chip, 2 GB of RAM, a 500 GB Serial ATA hard drive (7200 RPM), a slot-loading DVD+R DL “Super Drive”, ATI Radeon HD 2600 PRO graphics with 256 MB of GDDR SDRAM (PCI-Express), a built-in iSight webcam, a microphone and stereo speakers, as well as 1 Firewire “400”, 1 Firewire “800” and 3 USB 2.0 ports. It also has built-in draft and enabled AirPort Extreme (802.11g) and Bluetooth 2.0+EDR, Gigabit Ethernet and mini-DVI capable of supporting a second display. The cooling system is CPU controlled and the in-built speakers are mounted beneath the 24” screen for the sound to bounce off the desk or other surface. The speakers’ grills also work as the vent ones. The iMac (24-inch, 2.8GHz Intel Core 2 Extreme, Mid 2007 AI) is shipped with an ultra-thin aluminum Apple Keyboard and Mighty Mouse. Introduced on August 7, 2007. Processor type: Core 2 Duo (X7900) “Merom”. On-Board Ram: 2GB, DDR2 667MHz (2 x 512 MB installed in two slots). Storage: 500 GB, 7200-rpm Ultra ATA-66. Preinstalled OS: X 10.4.10 (8R4031). Apple Model No: A1225 (EMC 2134). Mind, that this is a build-to-order model. Centrino Santa Rosa motherboard platform supports HD video and large amount of RAM and provides the faster system boot as compared to previous Intel iMac iterations. Looking where to sell your old iMac for cash? 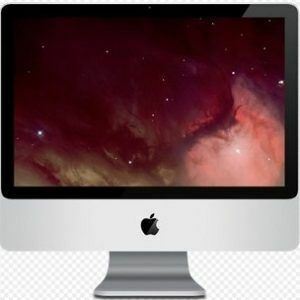 Here’s the right place: iGotOffer.com buys used iMacs and other devices for the best price online: iMac sale. Apple iMac 24 inch 2.8 GHz (New processor). Video published by ApFaqTech on May 6, 2008. Here is the review for the Apple iMac 24 inch 2.8 GHz with the Intel Core 2 Duo processor. Processor speed is also available as 3.06 GHz.